The corpse of an unidentified figure with human-like hands has been found floating in a stream in Latin America. Locals on the continent believe the creature to have been the mythical vampire-like chupacabra. 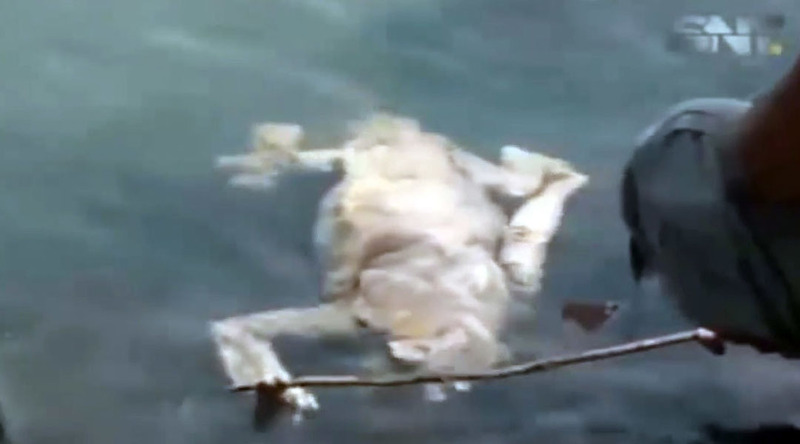 The body was discovered in the town of Carmen del Parana in southern Paraguay by the locals, who filmed it floating face down in the water. The lifeless creature appeared to be the size of an average dog, and seemingly had fair skin with no fur, and four limbs with human-like fingers and a long tail. Rescue services and experts were called to the scene to fish out the body and determine its origins. Unfortunately, the discovery was made a little too late to prove or deny the existence of the animal vampire; the body was badly decomposed. “Given its traits, we believe it is a species of monkey because of the hands and legs… But in reality no one can say what exactly the creature is as it was found in an advanced state of decomposition,” the commander of the fire brigade told local news. Although stray dogs, coyotes and foxes have often been mistaken for a chupacabra, fears of the blood-sucking creature have spread as far as other continents. In Russia, the agriculture ministry of the Moscow region had to officially deny the existence of the chupacabra, after dozens of farm animals were mysteriously killed in 2014.